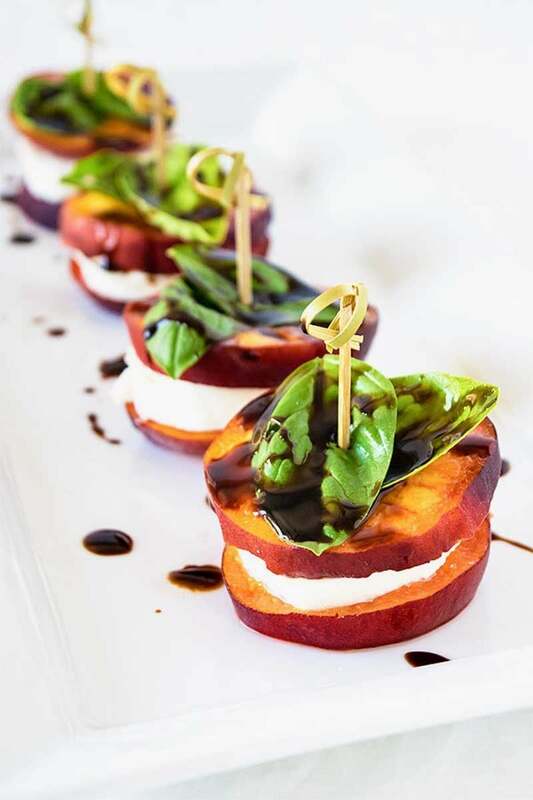 A fresh way to enjoy classic caprese, with juicy peaches, soft mozzarella, balsamic reduction, and fresh basil. Makes for an easy party appetizer! Did you know that we’re knee deep in peach season? I certainly wasn’t aware, but the avalanche of amazing peach recipes in my Pinterest feed helped tip me off. We’re being invaded by all things peach, and I’m pretty sure I’m okay with it. I’ve talked a lot lately about being anxious for the fall months – and don’t get me wrong, I’m totally ready to welcome all things pumpkin with open arms – but even still, it wouldn’t be right not to take a little time to appreciate what’s great about summer before it’s gone. Now that we’re in August, I’m sure there are plenty of others trying to grasp the last few straws of summer, especially since I nearly had to take someone out in Sprouts in order to secure the last few peaches they had in stock. You need to be fast when a food blogger on a mission is around! Serve those peaches up caprese style! 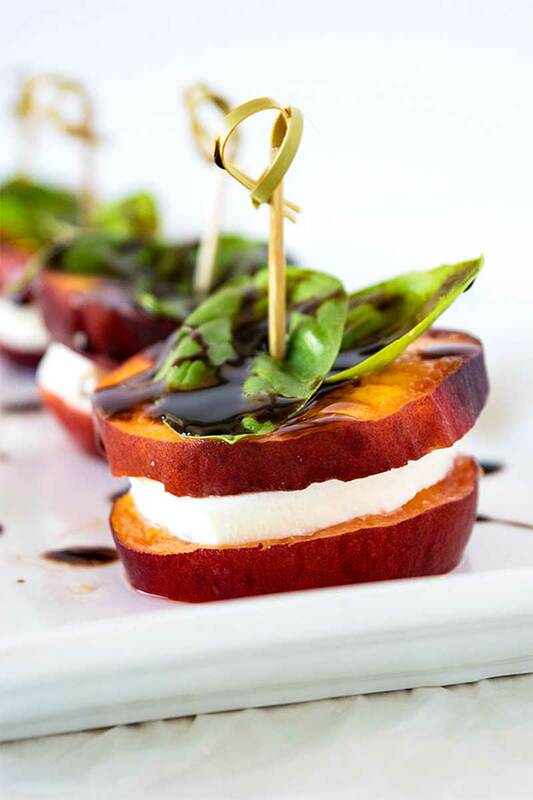 Because if peaches are the fruit of late summer then mozzarella and balsamic glaze are… oh, just the best combo ever. Period. But then again, caprese does pretty well with just about anything that grows in the warmer months, so I suppose that does award them some summer street cred. The next time we host company at our house, I’ll definitely be making these again. 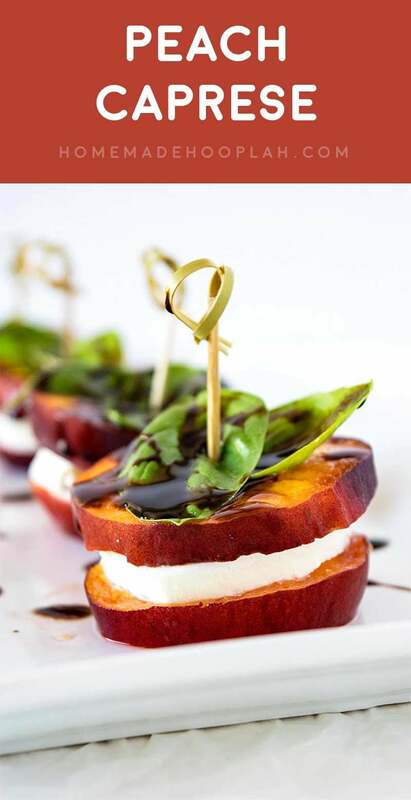 They’re the perfect combination of sweet (peaches), savory (mozzarella), and slightly sour (balsamic). Great for snacking on while sitting outside in the fading summer light. So what about you? How do you like to eat your peaches? Cut mozzarella ball into four even pieces. If you'd like the mozzarella to fit evenly within the peach slices, you may need to cut some excess off around the sides. Assemble by placing a slice of peach on the bottom, followed a slice of mozzarella, and capped with another slice of peach. Finish by placing two basil leaves on top. Drizzle with balsamic glaze. If using toothpicks, you may need to cut the toothpicks in half so that they're the proper height. Loving this delicious perfect bite, what a treat! Thanks again for stopping by and sharing your amazing recipe at #TryaBiteTuesday! Hope to see you back again – giving you lots of loves and shares today. What a great combination of flavors. Pinned! Thanks for sharing at the Weekend Blog Hop at My Flagstaff Home! Oh what a brilliant idea!! This would make the perfect party food! Thank so much for linking up with our Fabulous Foodie Fridays party! This meets all my criteria for awesome starters. Easy. Pretty. No bread. Love them. Thanks for linking up at #SaucySaturdays. The peaches have been especially delectable this year. Thanks for sharing with the #homemattersparty. We have the most creative guests this week! We are enjoying our fair share of peaches right now! 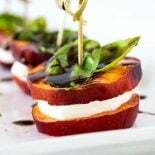 I would never have come up with the idea to use them in a caprese style appetizer – gotta give this one a try and pinning to my peach board! This looks amazing!! I love that you used peaches instead of tomatoes! YUM!! Congratulations, Chrisy! You’re being featured at the Weekend Blog Hop at My Flagstaff Home. Stop on by on Thursday evening (myflagstaffhome.com). I just stopped by and saw! Thank you Jennifer! I know right? All the good ones will be gone soon! I already need to make this again. Yummy! Looks delicious. Thank you for sharing at Merry Monday! Ohhhh so juicy and refreshing! Definitely want to try this! Thank you so much for sharing with us at the Inspire Me Mondays Link-Up! No problem Bridget! Thanks for hosting and thanks for stopping by! Awesome, thank you so much Helen! I’m loving this – I would have never thought to put all those ingredients together. Yum! Thanks Carole! It’s unique but tastes amazing 😀 Strawberries are good caprese style, too.